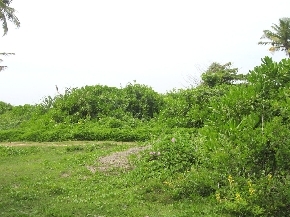 Beach front bare land (112 perches) in Kosgoda. Just 100 meters to the Galle Road. Lovely beach with a reef. Bordered by a canal protected with a gabion wall on one side (East) and the beach on the other side. Suitable for a boutique hotel/cabanas. Selling for an urgent cash requirement.